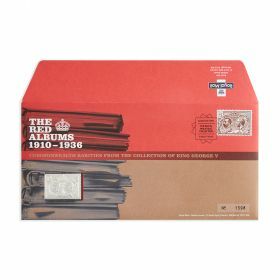 Focuses on British rarities within the red albums at the Royal Philiatelic Collection. Focuses on British rarities within the red albums at the Royal Philiatelic Collection. An opportunity to own both The Queen Elizabeth II and George V double head 1st Class Stamp and an ingot which is an engraved replica of the stamp affixed to the cover. The cover is also cancelled by a unique handstamp, completing a hallmarked .925 Sterling Silver collector's must-have.